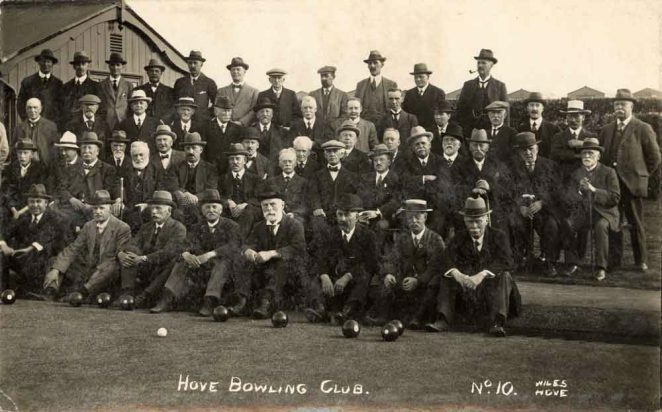 This recent addition to my collection of real photo postcards by Wiles of Hove shows the members of Hove Bowling Club. There is no date on the photograph and the postcard has not been used. The club appears to be in the same place today because there are still beach huts just behind it as shown in the photograph. I would be interested to know the date which would be around about 1910 to 1920 I think. Is your grandfather in the photograph? I would think that members of the current club ( Hove and Kingsway) would be glad to try and help.